26 Dec 2012: I have been making a graph comparing annual energy figures, and I cannot understand why I didn't do it before - it makes a good illustration of the 'struggle' to maintain Net-Zero levels. The Blue (house) and the Red (GSHP) lines match each other closely, with a consistent 2,000kWh difference (lighting, cooking, power). I have had those two on graph for a long time. The new feature is the inclusion of the yellow line for the PV roof. 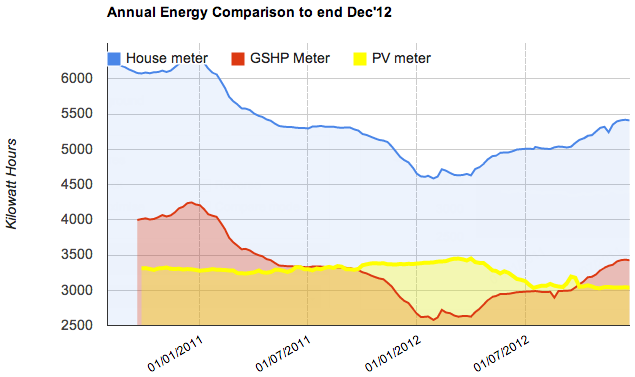 The important comparison is of the Red (GSHP) and the Yellow (PV) lines. The GSHP curve fell substantially after the solar charging was installed, and levelled off at a figure close to the PV energy generation. 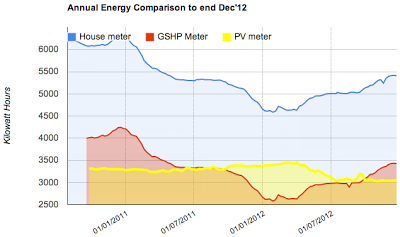 The sunny year of 2011 caused them to diverge significantly, finishing with a credit difference of 900 kWh (2,550 to 3,450). The rainy grey weather of 2012 has lowered the yellow and raised the red line, so for the current 12 month period, we have a 300 kWh deficit and are not Net-Zero (3,430 to 3,030). The biennial figure is more benevolent, so taking the figures for the last two years, we are Net-Zero with figures of 3,100 for the GSHP and 3,200 for the PV.